There are not enough awesome things in this world. And by awesome, I mean the literal sense of the word in that something inspires awe. Not the casual usage tossed out to describe Thursday's shrimp sandwich. A thousand commercials a day tell us the subpar is extraordinary. We praise mediocrity. And settle for less. We may, as a nation, encourage ourselves and others to celebrate accomplishments, but not to actually accomplish. How many dreamers along their paths with sleeves rolled up were mocked, ridiculed, dismissed, or told to settle for less? What defines awesome for you? April 12, 1981. 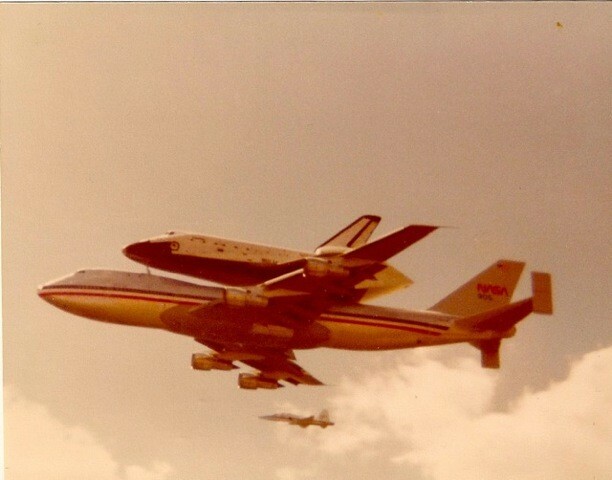 My dad woke me up early to watch the first launch of the Space Shuttle Columbia. I was able to watch the beginning of a new era unfold while curled up on a plaid gray and brown couch, with my NFL logoed bedspread. This was awesome. But, not quite THE EVENT that would define my awesome, and stay with me to this day. Sometime in my 30's I was at a bar in LA with two good writer friends, Mark Glinksi and Joe Reno, when a newscast on one of the hanging TVs announced more budget cuts to NASA. Mark declared money for the space program would be better spent on feeding the homeless and fighting poverty and countless other social issues. No, I said. As a country, as a people, as a race of explorers, we must always be striving to elevate ourselves. How can we not give the best and brightest citizens the resources to work together and create and inspire and en-deavour to do the seemingly impossible just beyond our reach? Dave, Joe said, people are starving. February 1st, 2003. I'm sitting at the Salt & Pepper Diner in Chicago on Clark. I am with Pete Dully and Mark Glinski. It's an upscale diner with TVs. The Space Shuttle Columbia has broken up during re-entry. Seven shooting stars streaking across a western blue sky. My heart breaks. How could I argue with Joe and Mark that people were hungry and homeless? I would have argued though that some people are capable to do other things, and if a brilliant mind, such as an engineer working in a soup kitchen than it would be as much a waste of life as anything else. But I didnt have the words then. My Grandpa was a craftsman. Wood, metal, didn't matter. 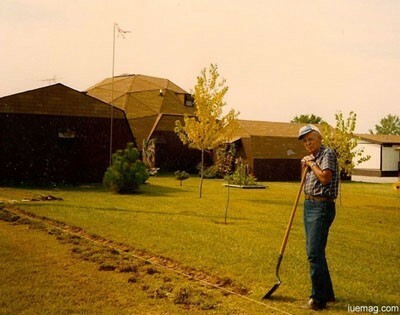 He built his retirement home, an energy efficient geodesic dome house. He also has always had a subscription to Popular Mechanics and Popular Science. What will the future be like? What are they developing now? How will we get to those far off planets? Look, a hovercraft you can build in your own garage. It comes in a kit. Powered by a vacuum cleaner motor. If only I was older. If only I had a job, I would buy one. We would build it. We can do this. Now in my 20s and I'm having trouble with my 1967 Cadillac. A few days later a heavy box arrives from my Grandpa. No note. Just a repair manual for GM cars from 1965-1971. I pop the hood, open the book and roll up my sleeves. Mission accomplished. There was a time when the space race filled our nation with brightness - maybe because of the unprecedented immensity of the goal, maybe because we were able to reach that goal by leaps and bounds? Look at us now. Can we no longer dream as a nation? October 15, 1996. My grandpa has a massive heart attack 16 years after his first one. At the hospital, my dad asks his father if he wants the doctors to perform "heroic measures". His last words: "No sense doing a job halfway". April 27, 1981. 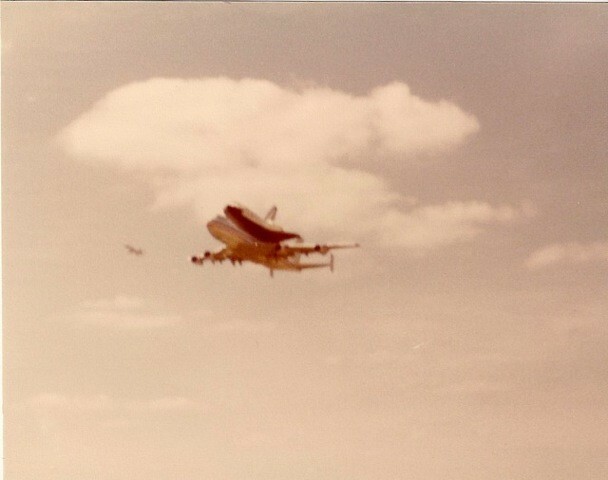 I watched the first launch of the Space Shuttle Columbia on our big console TV from my couch. 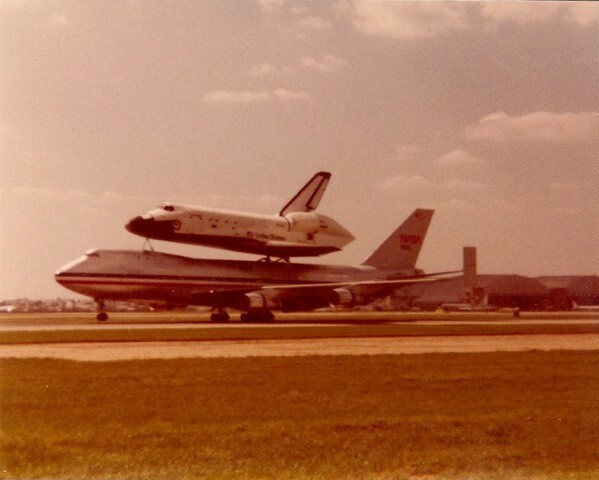 In those days, there was not a landing runway for the Shuttle in Florida where they launched, so the Shuttle would land in California and fly piggy-back on a B-747 jumbo jet to its home back in Florida. The 747 would have to refuel halfway home at Tinker Air Force Base in Midwest City, OK. My dad worked at Tinker as a Civilian Supervisor. It felt like a secret mission. I was pulled from school and I wasn't even sick! I took a point and click Kodak instamatic. At the guard station, my dad shows his ID and nodded toward me, and this is my boy. Less than a hundred yards off the runway we scanned the skies..
A former NASA center director once said to me, "during the Apollo era, we grabbed a hold of the future and dragged it into the 60's - that's how we got to the Moon." This sense of necessity to move civilization forward, to take huge leaps of advancement - technologically and otherwise - is what inspired that era, along with a healthy dose of competition. Competition will always be a factor as well, as we see the US-European-Russian space dominance challenged by China and India. It may be just that cocktail of rivalry and risk-taking we need to reinvigorate the exploration of the unknown worlds around us. An autumn Monday, 2011. Dawn. In the eastern sky, among the visible stars, is a tiny red dot. So small, so inconspicuous, so present and patient. Elsewhere, I believe, like-minded folks are already at work, sleeves rolled up, and turning dreams to visions and visions to goals. Crisp leaves swirl about my feet. I catch one. In the brightening light, it looks like an eagle's wing - fragile, curled, and able to catch the wind. And then I realize awesome things need not to be bold to inspire, but that we must still aspire boldly and to boldly go. Special thanks to John Beckman, Project Manager at the Museum of Science and Industry, Chicago, IL. An expanded version of this article originally appeared in Digital Americana Magazine (Fall 2011). Used with permission.